Caché supports SOAP 1.1 and 1.2 (Simple Object Access Protocol). This support is easy to use, efficient, and fully compatible with the SOAP specification. This support is built into Caché and is available on every platform supported by Caché. 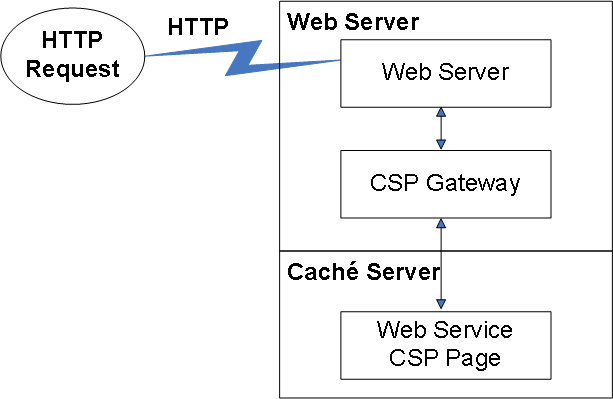 This section introduces Caché web services. By using the Caché SOAP Wizard to read an existing WSDL document and generate a web service class and all supporting type classes. A Caché web service class inherits from the %SOAP.WebService class, which in turn inherits from %CSP.Page. Because of this fact, a Caché web service resides within a web application that you configure within the Management Portal. For details, see the chapter Applications in the Caché Security Administration Guide. When the class compiler compiles a web service, it generates a WSDL for the service and publishes that via a web server, for your convenience. This WSDL complies with the Basic Profile 1.0 established by the WS-I (Web Services Interoperability Organization). In Caché, the WSDL document is served dynamically at a specific URL, and it automatically reflects any changes you make to the interface of your web service class (apart from header elements added at runtime). In most cases, you can use this document to generate web clients that interoperate with the web service. For details and important notes, see Viewing the WSDL, in the next chapter. 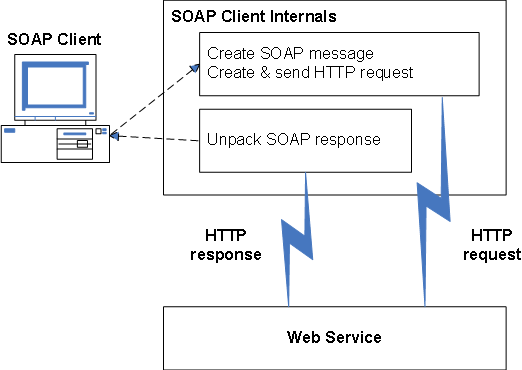 To understand how a Caché web service works by default, it is useful to follow the events that occur when the web service receives a message it can understand: an HTTP request that includes a SOAP message. Because the request is directed to a URL that ends with .cls, the web server forwards the request to the CSP Gateway. The CSP Gateway examines the URL. It interprets part of this URL as the logical name of a web application. The Gateway forwards the request to the appropriate physical location (the page for the web service), within that web application. When the web service page receives the request, it invokes its OnPage method. The web service checks whether the request includes a Caché SOAP session header and if so, resumes the appropriate SOAP session or starts a new one. This step refers to SOAP sessions as supported by Caché SOAP support. The SOAP specification does not define a standard for sessions. However, Caché SOAP support provides a proprietary Caché SOAP session header that you can use to maintain a session between a web client and a web service, as described here. The web service unpacks the message, validates it, and converts all input parameters to their appropriate Caché representation. For each complex type, the conversion creates an object instance that represents the complex type and uses that object as input for the web method. The web service executes the requested Caché method, packages up the reply, and constructs a SOAP response, including a SOAP header if appropriate. This section introduces Caché web clients. In Caché, you create a web client by using the Caché SOAP Wizard to read an existing WSDL document. The wizard generates a web client class and all supporting type classes. To understand how a Caché web client works, we follow the events that occur when a user or other agent invokes a method within the web client. Session support. As noted earlier, although the SOAP specification does not define a standard for sessions, you can create client-server SOAP sessions by using the CSP infrastructure and the session support provided by the %SOAP package. See Securing Caché Web Services. This section lists the basic standards and WSDL support details for Caché web services and web clients. Additional standards are listed in Securing Caché Web Services. WSDL 1.1. Caché web services produce WSDL documents that comply with the Basic Profile 1.0 established by the WS-I (Web Services Interoperability Organization). However, Caché web clients do work for more general WSDL documents. For information on XML standards supported in Caché, see the book Using Caché XML Tools. Caché does not support all possible WSDL documents. More flexibility is provided on the client side, because it is frequently necessary to create web clients that work with specific WSDLs that cannot be changed. This section discusses the details of the support. The WSDL documents generated by Caché web services do not include headers. Also, the web services that you can create in Caché do not reflect all possible variations. The Caché SOAP Wizard does not process headers of the WSDL. If needed, you can create custom entity resolvers; see Customizing How the SAX Parser Is Used in Using Caché XML Tools.